GLENDALE, CA: Members of the Armenian Youth Federation Western USA met with former Armenian parliamentarian, Lilit Galstyan, this week for a Q & A session regarding the current state of Armenia. 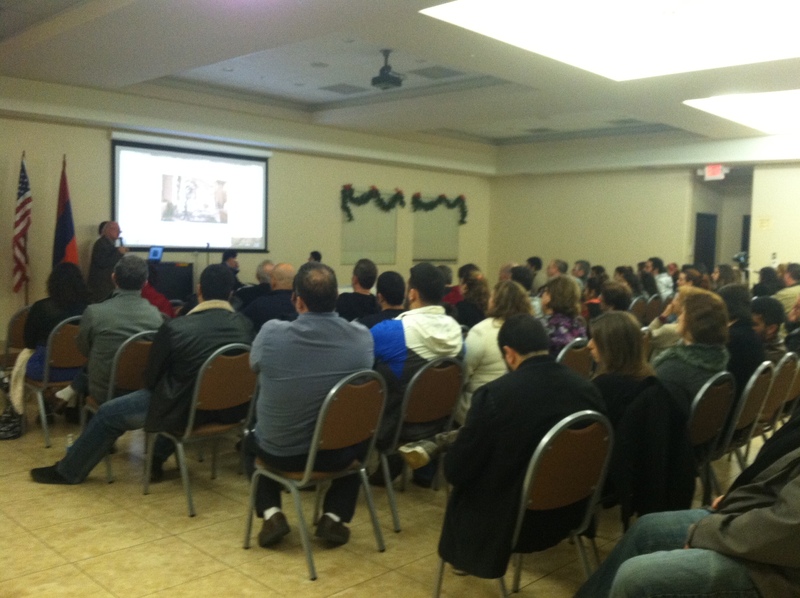 The discussion took place at Sardarabad Bookstore, whose unique atmosphere serves Los Angeles area Armenians as an important source of cultural wealth and knowledge. The youth engaged former ARF-D Member of Parliament, Lilit Galstyan, with questions pertaining to Armenian politics, the upcoming elections in Armenia, and the ARFs vision for the next term. The interview will be featured in the upcoming edition of Haytoug Magazine, which is the official publication of the AYF. The Haytoug represents the voice of the youth, and focuses on addressing critical issues that are often left overlooked by other media outlets. 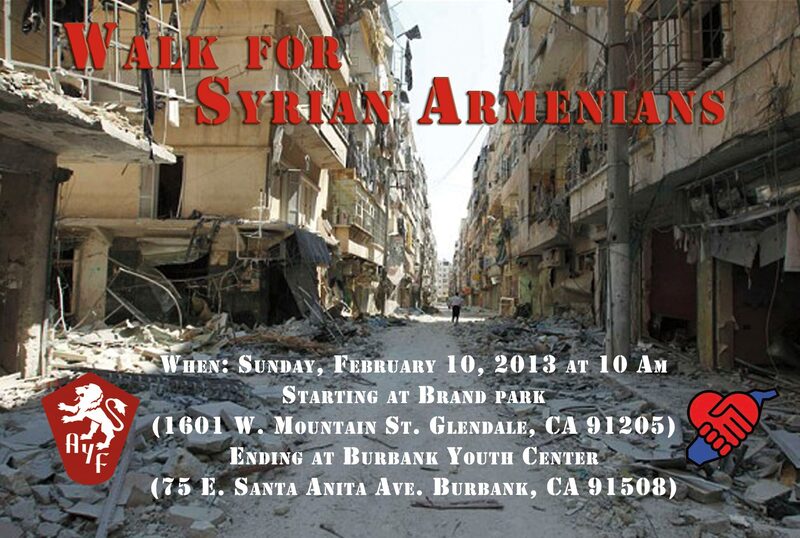 BURBANK, CA – On February 10th, The Armenian Youth Federation, Burbank Varak Chapter will be hosting a walkathon to raise funds as well as awareness about the Syrian Armenian Crisis that is currently taking place in Syria. The walk will start from Brand Park at 10 AM (1601 W. Mountain St, Glendale, CA 91201) and end at the Burbank Youth Center (75 E. Santa Anita Avenue, Burbank, CA 91502). During the walkathon members of the Armenian Youth Federation will be passing out informative brochures to the public informing them of the Syrian Civil War and the crisis the Armenians living in Syria are in. Funds raised from the event will be used to send aid to the Armenians residing in Syria through the Syrian Armenian Relief Fund. LOS ANGELES- As the situation in Syria worsens each day, the importance of education about the crisis in the region and its implications on the Christian Armenian minority has reached a critical point. On Thursday, December 27, the Armenian Youth Federation came together with members of the community in an Educational Forum about the conflict in Syria and its repercussions on the Armenian population in the region, as well as the homeland. The forum was open to the public and was meant to educate the Armenian community about the detrimental circumstances facing the Syrian-Armenian community today, while motivating its audience to take action and help spread awareness. Speakers at the forum included Ung. Seto Boyajian, Ung. Sako Mahserejian, and Ung. Sona Madarian. Topics of discussion ranged from the geopolitical implications of the Syrian conflict, effects of the conflict on the Syrian Armenian community and the homeland, to the future of the Syrian Armenian community. Along side the speakers discussion of the events that are causing the Civil War in Syria, the presenters also showed the current state of the Armenians in Syria as well as discussing the actions that the Syria Armenian Relief Fund has done since its inception.